Tonight we did something that we don't do much of around here, we went out. We socialized with strangers and drank beer for God's sake. What was the occasion that we left our dark hovel you ask? It was for Ron Tanner's (of Houselove.org and From Animal House to Our House) talk at our local reuse store, Construction Junction. While the talk was nothing I hadn't seen and heard before, it was lovely to be out and talk to people for a change, especially since with the storms we have no foundation and still have a tree in the way. Local beer and good cheese soothes the troubled soul . . . While we wait for the big stuff we're in a bit of a holding pattern. 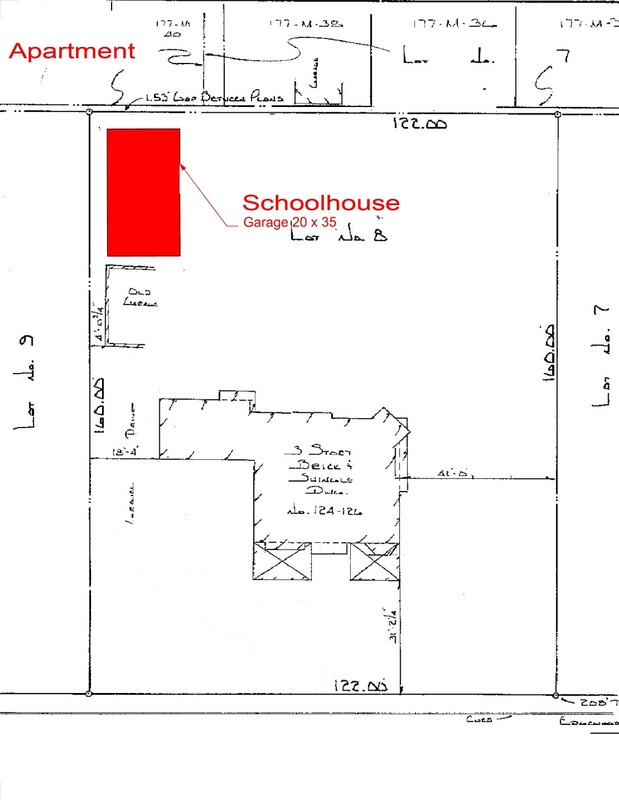 We will have a house full of guests in about a month, and it doesn't look like we'll have the schoolhouse up like we planned, which is hugely disappointing. It also means we won't we able to re-stash everything in it like we had planned, which makes cleaning up "complicated" . . . Although I'm not one to solicit advice, with people commenting regularly (which makes me giddy, so thank you) I'll be brave enough to ask for some tips - how have you managed guests (let alone made them comfortable) in a house that's torn asunder, with all the filth and clutter that goes along with it? Now that I've begged you for advice, want to see something that two people shouldn't be able to do on their own? 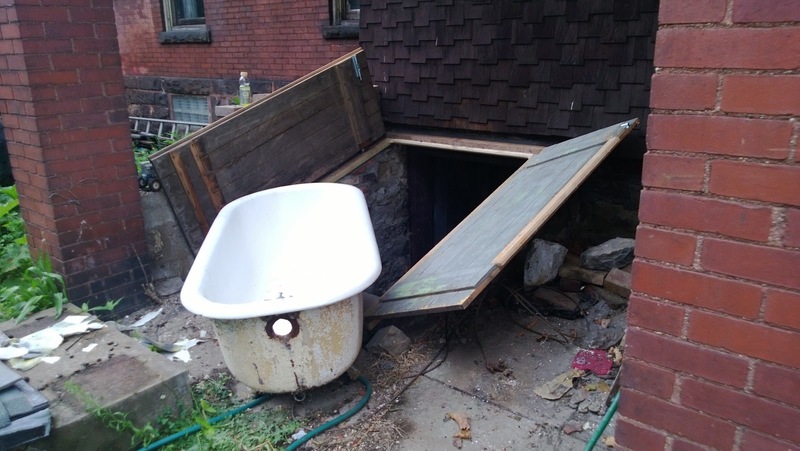 We were given this tub shortly after we bought the house, stashed it in that corner, tarped it, and haven't looked at it since. Even worse, that corner has been full of stuff since the day we first looked at the house, stuff that hasn't been touched in 2.5 years. Cleaning it out revealed 3 enormous multi-pane windows, trash, a huge bimini top, trash, a vintage rolling edger, trash, trash and more trash. The windows are awesome though . . .
Yup, just more of the same . . . Tomorrow is tree removal, Friday should be the foundation. While we're biding our time I took care of a little project that has been lingering for over a year now. About a year ago the mason who did the stone work on the stairs managed to knock over a stack of 2x4s, one of which went through our entry doors. The broken pane has lingered in its taped up state for various nonsensical reasons. I have no fear of working with glass - I have plenty of wavy glass stockpiled, I did glassblowing for years, used glass in metalworking projects, and have dabbled in stained glass work - it's really inconceivable that I was intimidated by this project. I think my main worry was braking the trim pieces that held the pane in place. That ended up being that hardest part, as being patient and working slowly isn't my strong suit. Everything turned out beautifully though, and I even got the glass cut on the first try. It's a good thing too, because I have a gallon of glazing compound that just came in the mail and 60 panes to cut and glaze (schoolhouse windows I'm looking at you)! 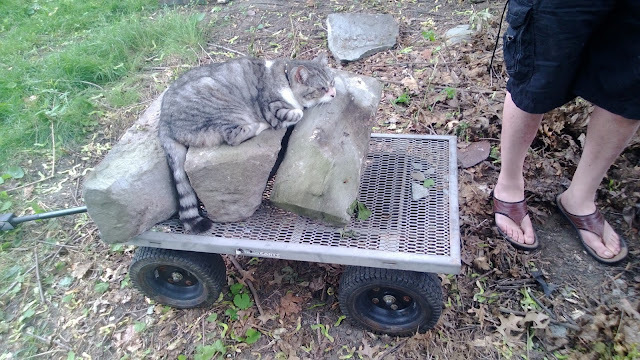 In the continuing saga of brick and stone hauling, we moved more bricks and stones. Fascinating right? So fascinating in fact that rather than finish (we're nearly done), we dug out what we speculated might have been the privy before it gets covered by a schoolhouse. 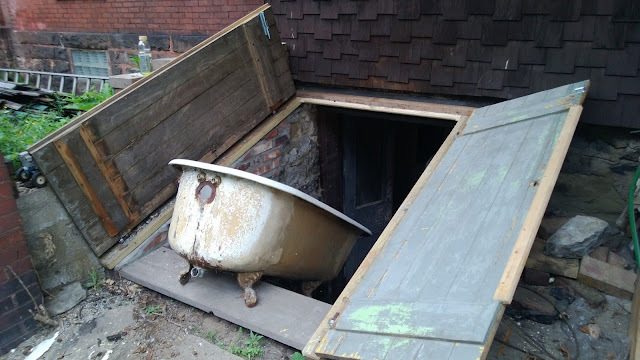 Although our house has had indoor plumbing since day one (courtesy of an immense cistern, gutters, hand pump, attic holding tank and gravity), many houses like ours still had a privy for the "help." In our case, the house always had at least two live-in maids according to censuses, and may have had additional help, such as a cook or gardener, during the day. 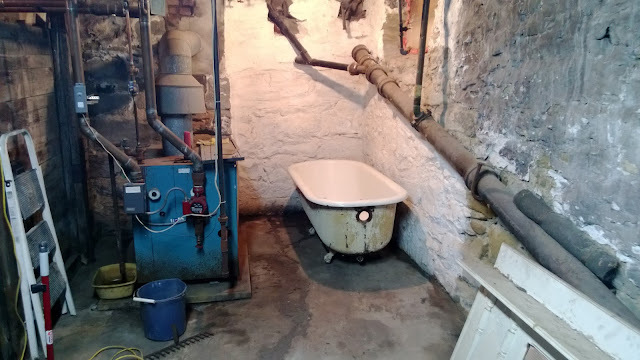 Privys were often located near the edge of a lot, close to the service areas of the house, and were filled in when the house gained additional bathrooms, or the age of hiring help had passed. 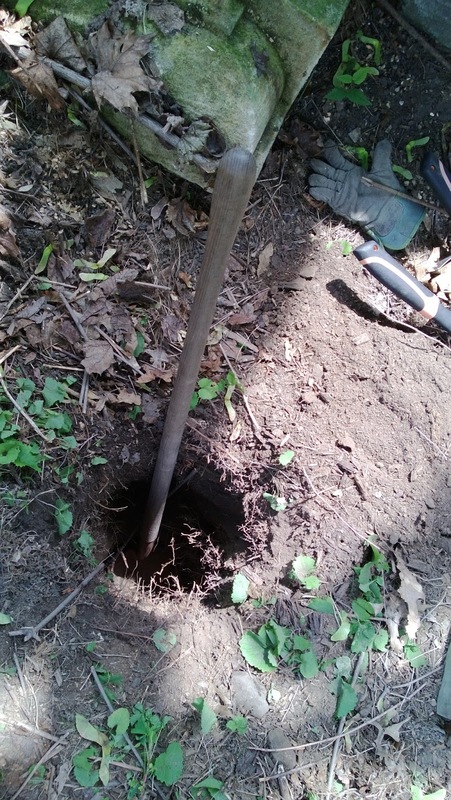 To find one today, look for a depression in the soil in likely areas, and try sinking a thin, long, rod of metal down into the center - the dirt will typically feel loose, and sometimes you'll hear a grinding as it hits glass or debris (privys were used for all kinds of "waste"). 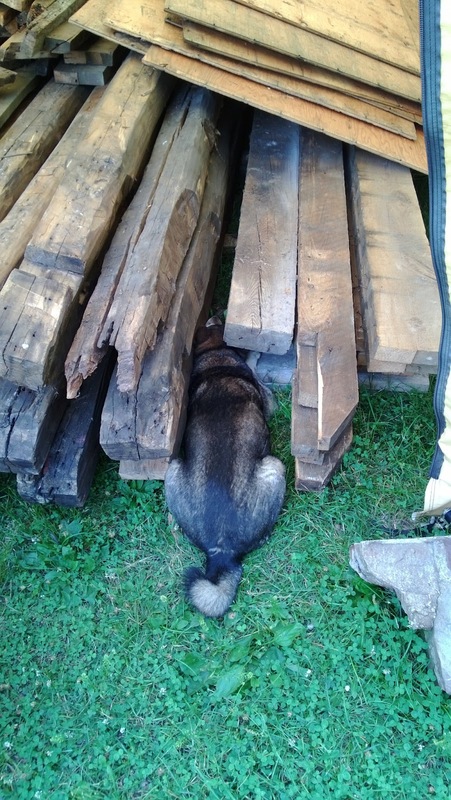 I really only know what a friend and the internet has told me about this, but our depression met all of the criteria, and I found an antique rasp in the first six inches, so my hopes were high. After digging four feet down however, it was sadly concluded that we were digging out an ancient rotted out tree (and if anyone reminds me that many privys were wood lined I'll cry). After digging that far down it seemed a shame to just fill it back up, so we grabbed an empty Gatorade bottle, and put a note (see title) inside, and filled her back up. I hope I'm long gone before anyone digs that up. I fear their wrath . . .
Happily, we're done de-nailing the beams and framing lumber - which, paired with clearing out the footprint, means we're ready for tree removal and the foundation. Next week should bring visible progress, done by someone other than yours truly . . . 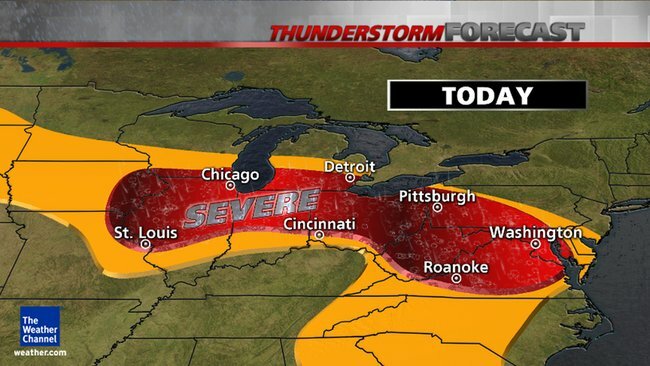 I'm thinking I need a lounge chair and a cold drink to enjoy the experience. 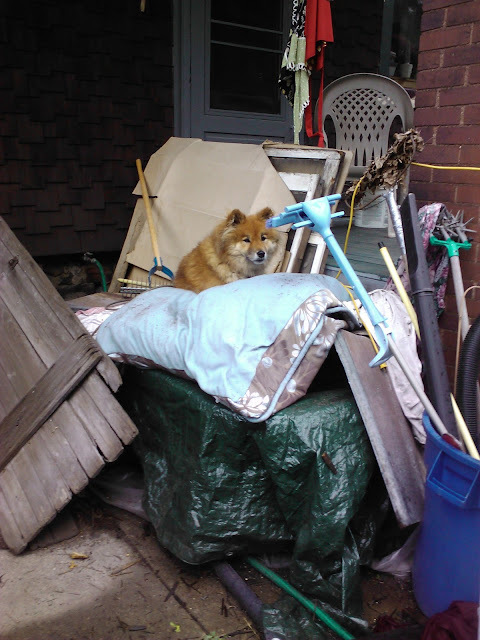 What involves demolition AND camping, with a severe thunderstorm warning thrown in for fun? You guessed it, schoolhouse moving day(s) has arrived. We'll be gone for three days, and if my phone cooperates, I'll add photos to this post as I can (hence the no pretty fonts or formatting). Wish us luck . . .
Well, the truck, trailer and lift rentals are booked which means the schoolhouse is definitely coming home to roost. The plan is to begin deconstruction Wednesday, with our carpenter joining us on Thursday, and loading and moving it on Friday. We will begin rebuilding it as soon as the foundation goes in (a phone call I need to make tomorrow). We almost had to walk away as the extra day of deconstruction and the lift rentals put us over by quite a bit. 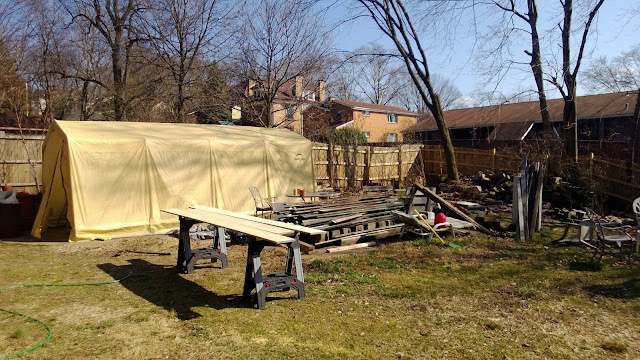 We had planned on doing the siding ourselves if we had the time to save that chunk of money, now, we have no choice but to do it ourselves . . . fie. At this point we're just too enamored with the additional privacy, storage, and being able to see the final layout of the yard (not to mention a home for Daphne) . . .
What this means is that we have two weeks of manual labor ahead of us. The mansion that once stood behind us (now the evil apartment building we're trying to block out) was carried, stone by stone, and brick by brick, into our backyard decades ago, and this pile sits right where the schoolhouse will be. 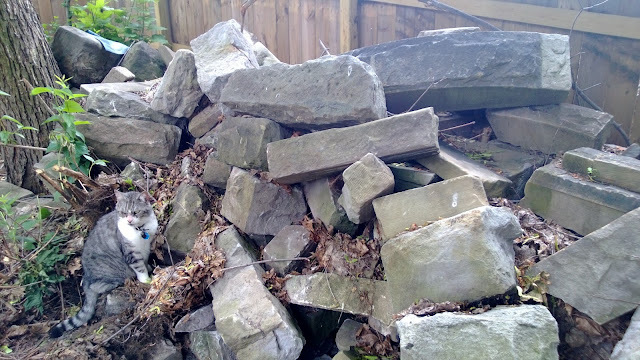 Many of these stones (mostly faced limestone with decorative edges) will be used when we rebuild the porch, but for now they're being distributed around the yard as borders to my flower beds. however, the cat was distracting . . . There's also a 20x10 temporary shed full of salvage and roof slate, and the piles of fir floor boards to find temporary homes for. Temporary homes of course require that I clean out the basement, which is where I spent most of the day. One shower and several hours later I'm still brushing imaginary webs off. Despite finding cool things (and by cool I mean heart-breaking) buried everywhere we've dug so far, these piles have been devoid of anything of interest, with the exception of one solitary black plastic horse. I don't think I've ever been so happy about a piece of plastic . . . It can't possibly be (unofficially) summer already, but here I am, with a to do list a mile long, and it's far too hot to be working. We sat down and made a list of stuff to do this last week, and remarkably managed to not do a single thing on it. This isn't to say we haven't been busy, we've just not been busy getting anything done. Actually, we did finish something, I managed to finish painting the last corners of the master bedroom, a project almost two years in the making. This means that the paint cans no longer have to live in the fireplace! The last places I had needed to paint were around the top of the fireplace mantel. There was evidence that there had once been an overmantel, so when we pulled two fairly simple ones out of a house about a year ago we knew one would go in here. We had foolishly thought we'd have finished stripping the paint in here by now, and were waiting to strip the overmantel at the same time, but since that clearly isn't happening anytime soon, we went ahead and installed it. Although the scale is right, the spoon-carved designs clearly date it to about a decade before our house was built, but I doubt anyone but me (and now you) will notice that it clashes with the (dare-I-say) Moorish turquoise tiles. 5 different types of tile, all in need of scrubbing . . .
Because of the set up of the room (typical Victorian, lots of doors, windows and fireplaces to work around), we were forced to put the bed in front of one of the windows (to the right of where the closet once was). In addition to looking awful, the sun always managed to find a gap in the curtains and get you right in the eye at the worst possible times (fellow migraine sufferers will understand). We tried to get used to it for a year, but with the closet gone and the room shaping up we decided to take action. We had planned to hang curtains behind our headboard, blocking the window and adding some symmetry, and when we found these antique/vintage foxes we figured we'd add them to the mix (one of my many minor obsessions). All that velvet paired with the huge iron bed does end up being a little overboard, but I guess we don't describe our decorating style as Nouveau Industrial Victorian Hunting Lodge for nothing . . .
size king, which is odd, and aggravating . . . This bedroom must have been something to see in its heyday. Stained woodwork, interior shutters (we can see the mortises for the hinges, they're missing from every room on the first and second floors), the moorish looking turquoise tiles, the Japonesque silver and white cloud wallpaper on the ceiling, gas lights (you can see one of the pair of sconces peeking out next to the bed on the right) and anaglypta under the windows instead of the paneling they used downstairs. Oh, and her . . .
She was my housewarming present from the house. There was so much stuff in the house that I didn't find her till about a month after we moved in. I *may* have sat on the floor and cried. May have . . .